All of life depends on predicting the future. Even the humblest single celled creature does something to skew the probabilities in its favour. When you evolve an eye you can predict when something big is intending to eat you. If you are a plant you can grow towards where the light will most likely be. It is in fact this ability to look forwards in time even the tiniest bit that makes living stuff different to other matter. Once you can make this prediction the possible course of future events you can then act to increase the possibility of a good outcome for your own continuance. If you guess right you get to live and reproduce, so evolution has been honing our future gazing abilities over billions of years. If you are a tree then you need to be able to look ahead and predict the turning seasons. If a bird also, if you wish to migrate or breed successfully. This sort of prediction means remembering the way cycles reoccur, if it happened once this way then the probabilities have to be high of it happening the same way again. So memory is a big advantage. Being able to pass this predictive information down from generation to generation via inheritance or nurture is another big weight tipping the scales of survival your way. If you can encode past occurrences, calculate their underlying cycles and then make predictions you are top of the heap. The downside to this is if any of the underlying cycles, such as length of seasons or climate change then you need to adapt fast. The fossil record underlines this fact. If a change occurs such as temperature or another species learning a new trick then you may not be able to update your predictive database in time to survive. So if your predictive capacity is encoded in DNA then you are vulnerable, but if it is in memory then you have a better chance. You can take risks and pass the ones that paid off to the next generation. How could Einstein be so wrong? It seems God is indeed very fond of playing dice. You may be wondering how this all fits into a painting blog? Well strange though it may seem such factors are one of the things that make producing artworks rewarding and frustrating in equal measure. As an artist you try things you have seen others do and by your successes and failures you increase the probability of your work turning out satisfactorily. If you are lucky you get someone who has already developed a method to pass on information, thus shortcutting your own learning process. 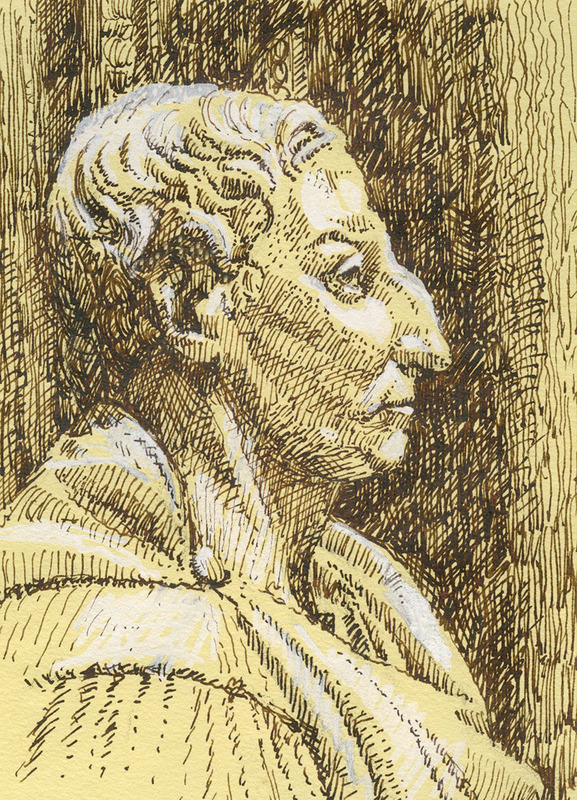 Nowadays you can access a vast compendium of information and the artworks produced by many generations. All of this helps but as with all life there are no guarantees. So what we need to do is increase the probabilities of succeeding. 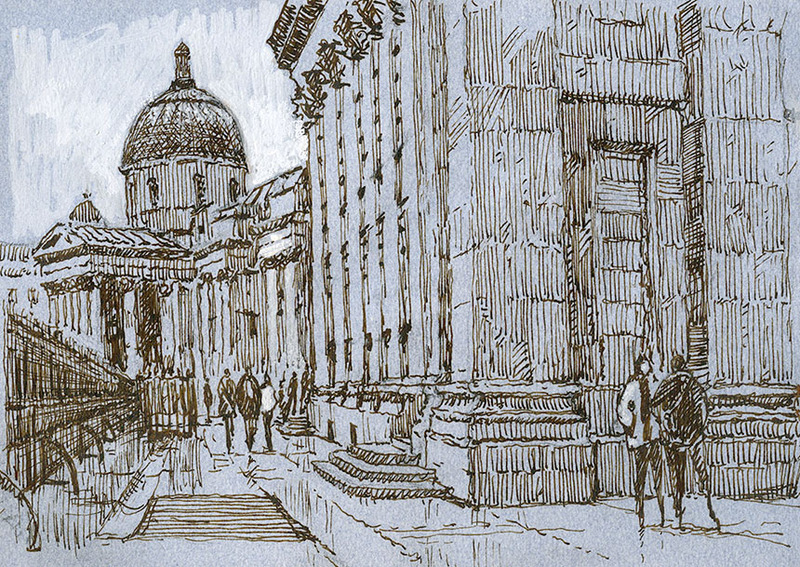 Gain skill in drawing, become familiar with how mediums react. Practice to hone your manual dexterity until it is automatic. In other words do everything you possibly can to load those dice in your favour. With a medium such as watercolour this is especially true. Quite a lot of the process is inevitably effected by chance, so luck is a big factor. The humidity of the day, its temperature, whether the wind is blowing or not, all can make a big difference. So you need to paint differently on a wet day to a summer scorcher. Even the kind of water makes a contribution to the way the paint lies and reacts to the paper, which is in turn another key variable. There can never be complete certainty and if you do stick to what is safe then you will end up in the doldrums reprising old paintings ad nauseam. Each time we paint we should gamble, but like any gambler we should shorten the odds in our favour as much as possible. I am still in the process of moving so paintings are a bit thin on the ground. This is West Bay near Bridport in Dorset. A difficult composition which doesn’t quite work. Need to be there very early or very late I’m thinking for it to be at it’s best. A parked Open Reach truck allowed me to get most of this down without being run over. I always look out for roadworks and similar as they sometimes give a chance at a view that would be impossible otherwise! This was very hard going. 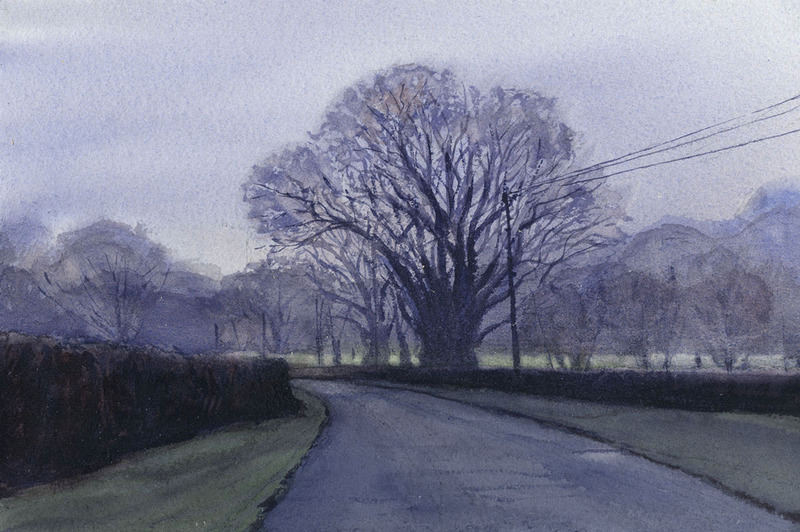 Just after dawn with a lovely mist but the paint wouldn’t dry. By the time I had finished the sun was out and the mist completely gone. So partly plein air and partly memory. In actual fact once a subject has changed that much it becomes almost a distraction rather than that much of a help. 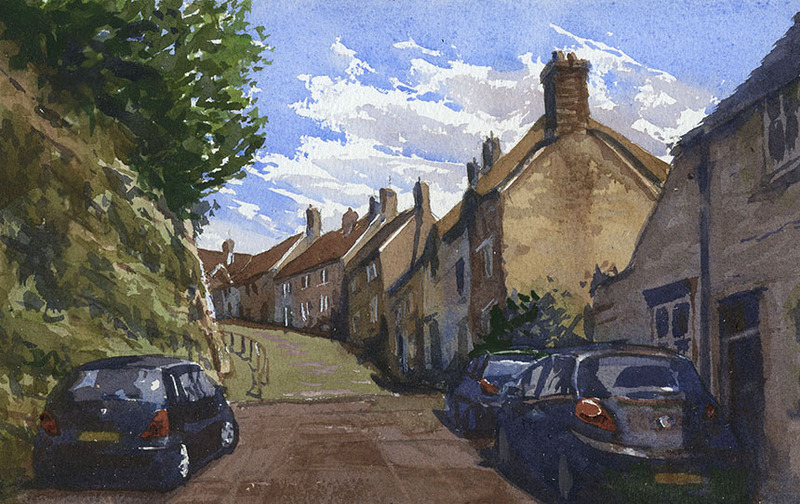 This is Gold Hill in Shaftesbury, I’ve done it from the top in pen and now here it is again from the bottom in watercolour. This is from reference but I must do it again on a wet and murky day. A visit to London to meet up with the Brass Monkeys. I ended up missing them due to the train being diverted via Tasmania, but got some drawing done anyway. This will be posted again as I have added washes. This is William Pitt the elder in the National Portrait Gallery. I drew this in pencil and then did the pen on the train as it went back to Dorset via Tasmania. This is looking up Old Compton St. I loved the Bentley surrounded by bin bags! I did the darks with a brush first and then added hatching. I shall do more of this as I rather like the effect. I had an opportunity to visit the National Portrait Gallery where they had an exhibition of John Singer Sargent, I had of course gone to see the Grayson Perry exhibits where he wonderfully sums up the nation’s beating heart by having a computer darn some words on a bit of cloth. It was more overwhelming than I had expected with all the words in different colours, a real treat. 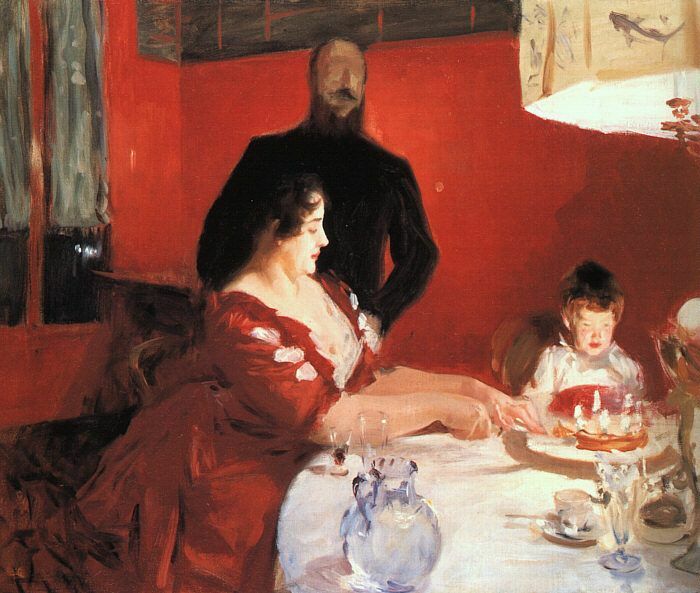 Having a bit of time spare I thought I would take in the Sargent too. It was fascinating, showing just how far art has advanced in recent decades. For a start every picture is ruined by the gratuitous use of skill. This takes them immediately beyond the reach of the ordinary man and into the muddy waters of elitism. He may be sublimely talented, but does he really have to push it into our faces? A more subtle artist would have painted them really clumsily, thus showing us the inner monsters we all wrestle with. Indeed standing in front of some of them you even feel as if there is a real person there who might start breathing. This is fundamentally dishonest to the materials of paint and canvas. There was also no excrement that I could see, which would have helped a lot I feel. One of the first pictures he had obviously given up on it, and I could well see why. I quite like the passage bottom left and wonder why he didn’t do it all the same way. He plainly wants to impress us with the way he has indicated the glasses with hardly any marks. Her name was Violet Paget but went under the name of Vernon. 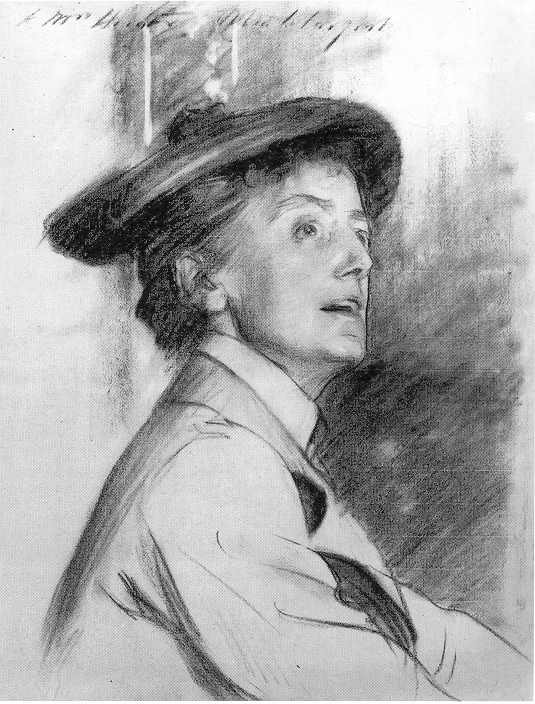 This is good gender aware stuff, but Sargent takes it nowhere, you only get the feeling of her character and that the painter was fond of her, rather than the deep political waters that ran under society’s polite upper crust. 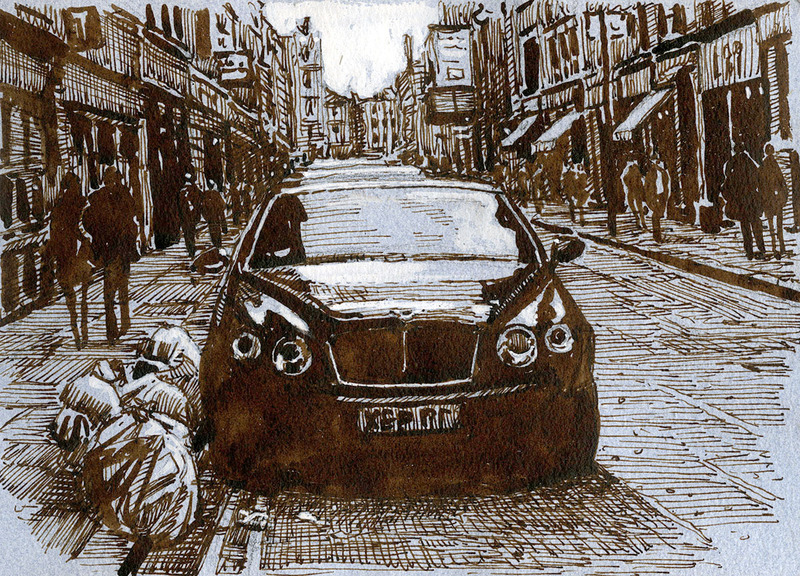 The drawing is worryingly precise, but still lost and found, distressingly clever. A more confident painter would have put all the lines in the wrong place. Not for the first time Sargent’s skill lets him down. Here for comparison is how a real artist paints a person with red lips and glasses. 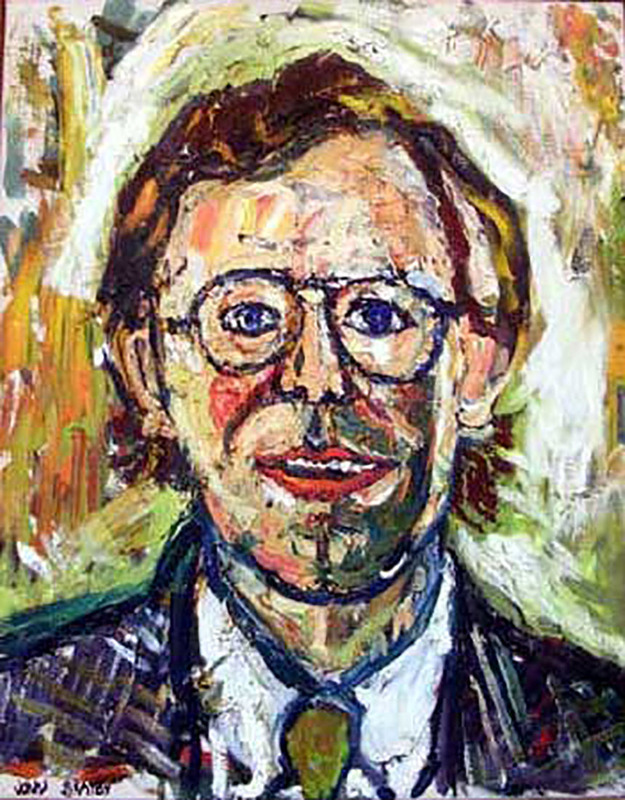 This is by the astounding John Bratby. Here the paint is good honest paint not trying to pretend to be flesh. The drawing as well is wonderfully incorrect with no edge at all in the right place. He carefully avoids all subtlety here and if he has any skill at all he wisely hides it. 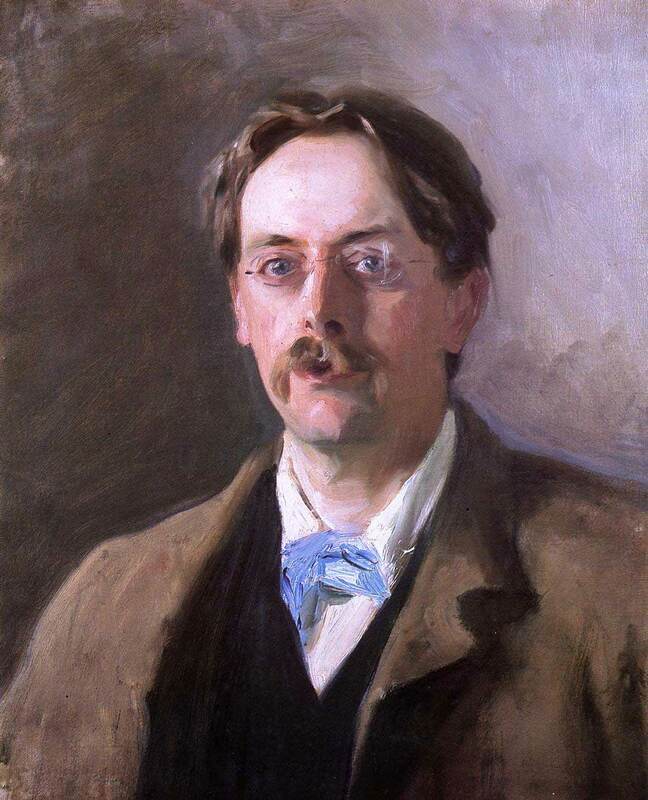 The artist travelled a lot in Europe and met many of the Impressionists. Here he makes a good beginning in using just the one colour mixed with black. Then he ruins it all by making the paint take on the illusion of a man. This catastrophically undermines the redness of the red. Most of my favourite artists just use colour straight from the tube, just adding a bit of white or black maybe. Here alas Sargeant wanders of into many subtle shades of the colour thus being untrue to what was written on the side of the tube and introducing unnecessary complexity and depth. I tried to imagine what the immortal Rothko would have made of this subject matter. Even with my poor photoshop skills I produced something far better than the oh so talented Mr Sargent. I might actually do a canvas of this for next years RA show. I was starting to feel pretty grim by now but spurred on by the memory of Grayson’s lovely pots with wobbly thick rims and crude sgraffito I persevered. I had hopes of this one. The bloke in the background has no face. The other two do which rather ruins it all. He just can’t resist painting things well. Of course he is using brushes, I think here I would have used a mountain bike. There were a few drawings. I didn’t bother to read the titles as I was loosing the will to live. What right has this man to push his superiority into our faces? Thank God we no longer torment our art students by forcing them to gain any of the skills that can produce such monstrosities as this. If they don’t have the skill or the ability in the first place then it saves so much work unlearning it later on. Here is what a mature artist who has never taken the fatal step of learning to draw can achieve when taking on a woman with a hat! Here everything is gloriously wrong, better still it is not even wrong in a good way. 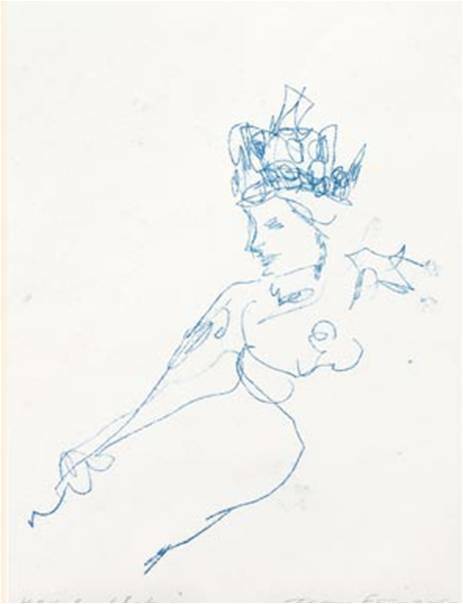 In this Tracy Emin avoids getting hardly anything right. My one minor criticism is that she got the crown on the head and that you can tell it is a crown, no body fluids either which is a pity. I could not carry on and had to escape. I wandered for a bit around the galleries and as if he was haunting me there he was again. Unlike the first one there isn’t the nice abstract bit bottom left. Even though it looks as if he dashed it all down in a few minutes it is distractingly real, far more alas that a photo. 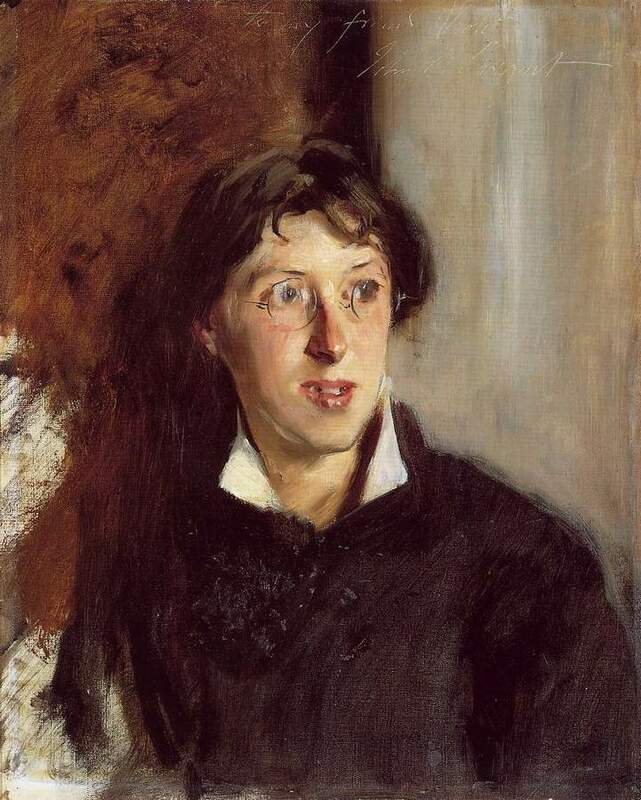 What really puts Sargent way down in the minor league of portrait artists is that he always goes for the obvious and hangs them with the head at the top. Despite it all if he had never wasted those years learning to draw divinely and paint as if angels guided his brush he could I feel have been a half way decent artist. 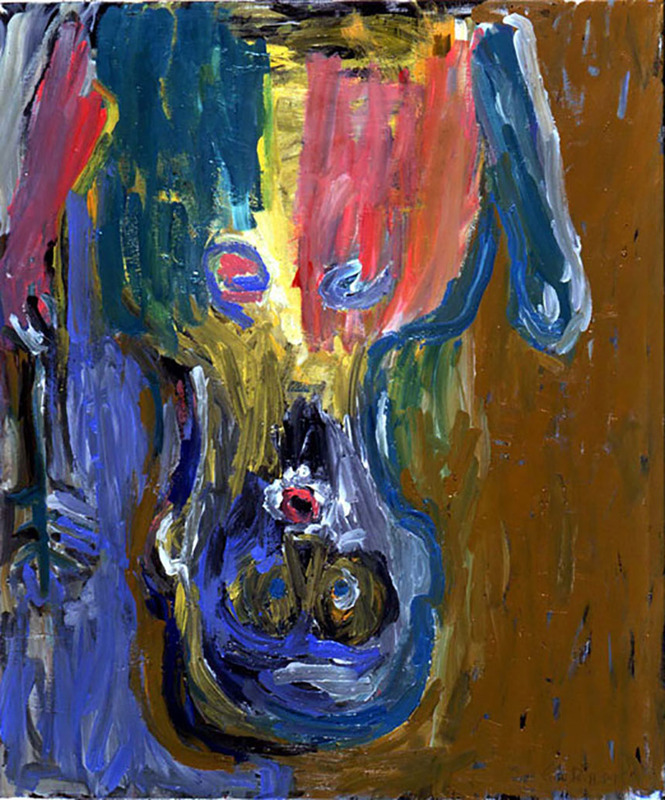 I leave you with a proper bit of painting by the supreme George Baselitz. Here everything is perfect the paint is right out of the tube with none of that fancy mixing. The drawing is nonexistent. Best of all though I have a suspicion that might be excrement in the background!